The NHL in the 1990s was a time of zany jerseys, glowing pucks and home games away from home. The Matrix were all born in that decade. But not everything back then was great, lest I remind you of The Macarena or Zubaz pants. Likewise, the NHL in the 1990s was a time of zany jerseys, glowing pucks and home games away from home. Not all of these seemingly-outlandish ideas worked — but as Wayne Gretzky once said, you miss 100 percent of the glow pucks you don’t shoot. Or something like that. Gimmick: NHL teams introduced a third uniform to wear on special occasions. The Skinny: While a handful of teams have used a third uniform from time to time — I’m looking at you, 1980s Penguins, with your canary-yellow “Sunday” sweaters — for the most part NHL teams had two uniforms: home and away. During the NHL’s 75th anniversary season in 1991-92, the Original Six teams introduced throwback sweaters to wear at home or against other Original Six teams. This also gave those teams another jersey to sell to their fans. 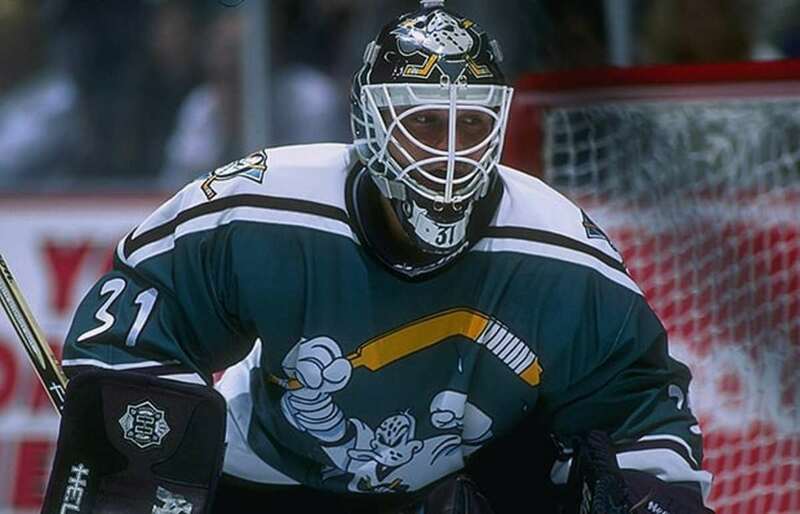 The idea really took hold in the 1995-96 season, when the Bruins, Penguins and Canucks introduced third jerseys — as did the Ducks, with their much-maligned Wild Wing sweater, and the Kings, with their infamous “Burger King” look. After that, the flood gates were opened. How Long Did it Last? It never ended. Did it Work? Yes. Every season since 1995-96, at least a few NHL teams have used a third — and sometimes even a fourth — jersey in their wardrobe. A few times, third jerseys were even popular enough to replace a team’s present jersey. Legacy: Watch any two NHL games in a row this season, and chances are at least one of the teams will be wearing alternate, commemorative, throwback, anniversary or Winter Classic/Heritage Classic/Stadium Series sweaters. In fact, third jersey unveilings have become popular fodder for press conferences, with that team’s captain usually playing the part of a confused runway model. Four glow pucks. Some of those third jerseys from the 1990s hurt to look at. Today, the third jersey is more about increasing merchandise sales than celebrating a team’s history. Gimmick: NHL games played in cities that did not have NHL teams at the time, including Hamilton, Saskatoon, Sacramento, Oklahoma City, Atlanta, Miami, Phoenix and Dallas. The Skinny: When the NHL increased the regular season from 80 to 84 games per team in 1992-93, two games were “neutral site games,” called such because they were played in cities without NHL teams. These games would allegedly grow interest in hockey in non-hockey markets, while also helping the NHL gauge potential cities for expansion — or relocation. How long did it last? Two years. Twenty-four neutral site games were played in 1992-93, and another 26 in 1993-94. No neutral site games were played during the lockout-shortened 1994-95 season, and the idea was ultimately dropped when the season was reduced to 82 games in 1995-96. Did it work? Sort of. Some of the neutral site games had low attendance, such as those held in Hamilton and Minneapolis — after the North Stars left the state — with less than 7,000 spectators. Other games, such as one between the Canadiens and Nordiques in Phoenix, were wasted opportunities; why play that game in front of 11,393 in Phoenix when it would have been a guaranteed sellout at the Montreal Forum or Le Colisée? However, Miami and Atlanta were awarded expansion teams, while Phoenix and Dallas were recipients of relocated franchises, so the NHL’s scouting mission worked well enough. Legacy: Two regular-season games were played in Tokyo at the start of the 1997-98 season to build hype for the 1998 Winter Olympics, which were held in Nagano, Japan a few months later. Today, the NHL will, from time to time, hold neural site games in Europe to start the season. Three glow pucks. Putting games that would have been guaranteed sellouts in cities that were mostly just “meh” about hockey was a loss leader for growing the league. Gimmick: Granting a license to almost any company that makes merchandise — particularly trading cards, video games and toys. collectible NHL coasters, but those never happened. 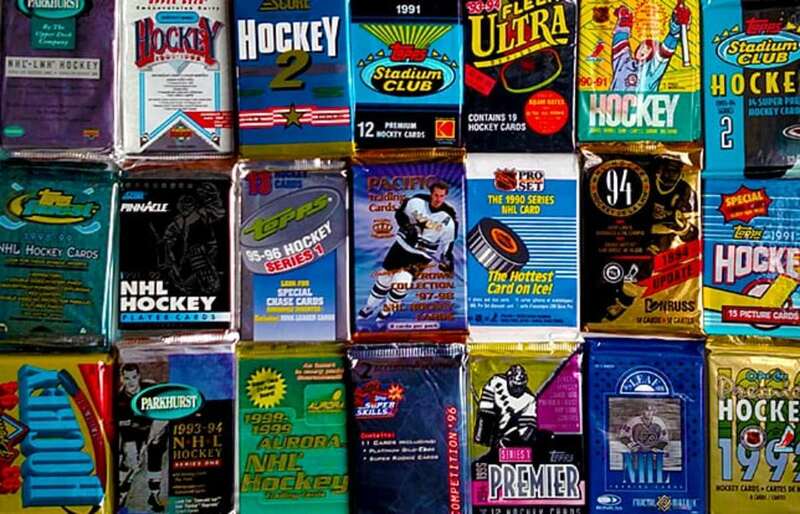 Up to six different hockey video games, licensed by the NHL and/or the NHLPA, were released each year. By the late 1990s, five different companies were making hockey action figures. How Long Did it Last? The NHL and NHLPA still license a lot of merchandise today, though both cut back quite a bit with trading cards in 2005 and video games in 2012. Did it Work? Yes. Trading cards, toys and other NHL merchandise are much more visible in the marketplace now than they were 25 years ago. Plus, the kids who collected hockey cards or played “NHL ’94” yesterday are today’s season ticket buyers. Legacy: Today, the NHL and NHLPA are high-profile enough to garner exclusive deals for trading cards and video games, as well as jerseys. The release of the new “NHL” video game by EA Sports has become somewhat of an annual event at the start of every hockey season. Gimmick: Making helmets optional for players so that they are more recognizable during TV broadcasts, thus making them more marketable. The Skinny: At the start of the 1979-80 season, helmets became mandatory for all players, though any player who signed a pro contract before then could opt out. Throughout the 1980s, the number of NHLers without helmets declined, and by 1992-93 only five players opted not to wear one. Silly players! How are fans going to recognize you from the nosebleed seats — or on TV — with your head covered up? So too thought the NHL Board of Governors, who voted to make helmets optional prior to the start of the 1992-93 season. Any player, regardless of when he entered the league, could ditch his helmet so long as he signed a waiver absolving the league for an injury. Not coincidentally, the league’s new U.S. television deal with ESPN and ABC started that year too. How Long Did it Last? Not counting the five veterans who were already going helmetless in 1992-93, either four games or eleven games, depending on who you ask. was talked out of it, somewhat ironically, by former teammate Doug Wilson, who played 16 seasons helmetless. Thus ended the league’s flirtation with making helmets optional. Legacy: When Craig MacTavish retired at the end of the 1996-97 season, he was the last NHLer to play without a helmet. Today, every NHL player must wear a helmet, though some teams allow their players to take the pregame warmup without one. Four glow pucks. Making the game less safe for its players, in the hopes of them gaining a little more marketability, was a pretty weak idea. Gimmick: Fox Sports made the puck glow blue during NHL broadcasts. FoxTrax System was a real-time, augmented reality system that superimposed a bluish glow over the puck during select NHL broadcasts. A blue comet tail would follow the puck when shot, passed or deflected. If the puck was shot hard, it was followed by a red streak, and if fired over 70 mph, a speed readout would appear on-screen. Also, luddites and technophobes — and pretty much all of Canada — hated it. How Long Did It Last? Three seasons. The FoxTrax System debuted during the 1996 NHL All-Star Game in Boston, then was used during select NHL broadcasts for the rest of the season, as well as the next two. The last game to use the glow puck was Game 1 of the 1998 Stanley Cup Finals. Fox did not use the FoxTrax System in 1998-99 — the last year of its contract with the NHL — after the NHL announced in August 1998 that U.S. broadcast rights would go to ABC for 1999-2000. Did it Work? If by “work” you mean angering many fans in Canada, then yes. Kidding aside, FoxTrax did make the puck more noticeable, though it did not particularly increase television ratings. Legacy: While FoxTrax became symbolic of the “Americanization” of hockey, its research and development laid the groundwork for most of the on-screen graphics used during live sports broadcasts today. Five glow pucks, obviously! While I am an unapologetic fan of the FoxTrax puck and subsequent innovations that it led to, in retrospect it was maybe a little over-the-top. But nothing seems more emblematic of hockey from the 1990s than the glowing blue puck. Sal Barry is a freelance hockey writer, web designer and college professor. He's also the webmaster of the hockey card site, puckjunk.com.